The booth featured some of the custom invitation and save-the-dates that we have worked on for 2008. Many brides asked us how this works, so before I take a moment to show off some of my fave designs, let me dish on how this whole "custom design" thing happens. My background is in design of all types, I was equally passionate about graphics and floral from a pretty early age. This might have stemmed from growing up in a household with a very creative mom that was a chef, artist, and always kept fresh flowers in the house, or just good creative genes all around. I had an equal passion for weddings, and a great wedding is all about throwing a perfectly planned party. So, my loves kind of merged together (or married, if you will) when I started working in the wedding world. There's lots of choices to make as a bride, from your colors to your location to the type of cake flavors you're going to have. And there's tons and tons of invitations and programs and save-the-dates out there in a sea of different colors and different concepts. With all these choices, there comes the inevitable problem that starts with "I really want this, but..." That's where Brocade comes in. 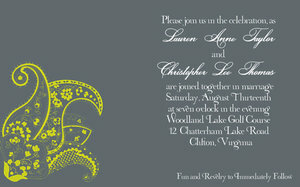 I work with you to custom design your invitation. We might start with a monogram, or an embellishment, or a little signature accent that's totally you and your groom. We might find a font you love and some paper that works with the perfect ribbon-- everything is completely unique and one-of-a-kind. Your wedding day is all about you, so shouldn't your paper products be the exact same way? Now, let's check out some of my favorite invitation design sets from the Perfect Wedding Guide show. 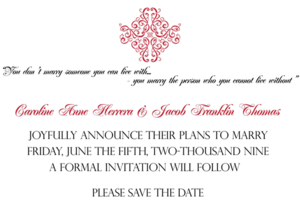 You can view all the invitations by clicking here, or check out the save-the-dates here. 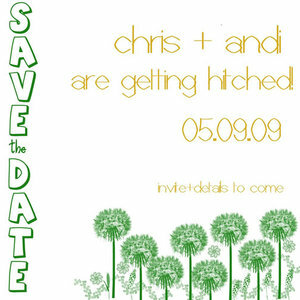 My favorite save the date: This adorable save the date is actually going to be a save-the-date coaster! How cute, right? And Coasters are super affordable, not to mention something your soon-to-be guests will want to use again and again! The color scheme is kelly green & gold, and this save the date will easily transfer to a cute square magnet, a glossy postcard, or any other fun design concept you'd like to dream up with us-- the sky's the limit. Cute dandelions echo the time of the year. This print was made from actual pressed dandelions for an authentic look. scheme for 2009 is rusty orange, deep teal, and crisp white. This invitation uses a unique embellishment at the head with a classic monogram and crisp text that announces a formal affair. 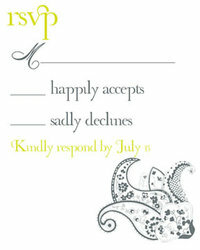 And lastly for today, one of my favorite save-the-dates. A pretty magnet design that uses the couple's colors: white, deep red, and black, along with a favorite quote about love. The embellishment at the top echoes in all of their paper products, including the invitations, a custom postage stamp, programs, menu cards, and even as a crest that will cascade down their cakes. Be sure to check out our other invitation and save the date designs, or give us a call to start working on your own personal masterpiece. And of course, your initial design consultation is completely free-- so what are you waiting for? Email me and let's talk about creating something that is 100% uniquely yours-- forever! Brocade's official "launch" was at the Perfect Wedding Guide show at the Ryman Auditorium. We'll be creating a separate photo gallery showcasing every detail, but I'd like to take a moment to thank the brides that came out to the show--- I loved chatting with you and hearing about your inspirational wedding days! The booth was right at the center of the Ryman Stage! 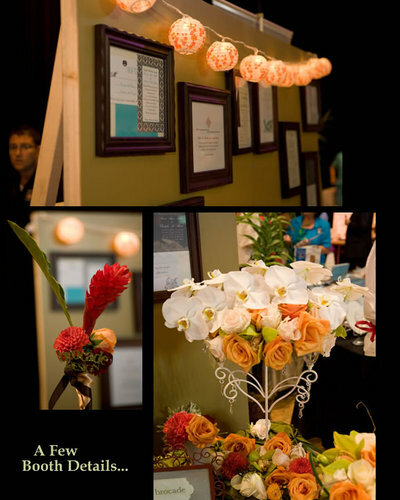 We made a wall to showcase some of our custom invitation designs for 2008-2009 brides and framed them, and then got these darling string lights from World Market. Our linen was a loaner from Julie Murphy of Julie Murphy special events-- this ooh la la couture linen really was a perfect backdrop for our bouquets that were on display!I designed a fun "microphone" to the left of the booth with a ginger flower blossom, dahlia, and orange rose. The front of our booth was flanked with cute bamboo mats (also from World Market). To the right, some booth details: our darling string lights and framed paper products are on the top; to the immediate bottom left: a close up of the brocade microphone-- the darling cut out is courtesy of our friends at Designs in Paper -- we just added some green glitter to make it even more fab-- and then a close up of our candelabra, decorated with gorgeous "Marco Polo" Phalaenopsis orchids, curious unique orange and creamy vendela orchids, green cymbidiums, and a bit of dahlia bud accents. 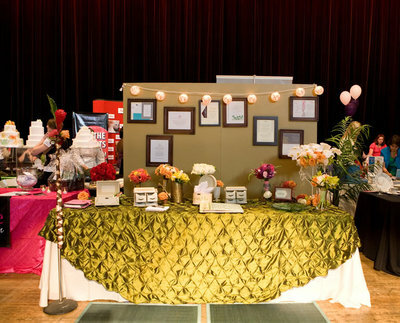 At its base are heaps and mounds of complementary flowers, and a peek at our framed "tags" that we adorned our mini-posey giveways for the show. At the top: rusty mango calla lilies are paired with sunny yellow roses and deep orangy-red dahlia for the perfect fall bouquet; second: sweet white lisanthus is paired with yellow freesia and yellow roses; and finally my personal favorite of the day-- orange and cream roses with lisanthus and green cymbidium orchids, with curly willow accents and bear grass loops. For the bride craving purple in her bouquet, this is a lovely arrangement of purple magestic roses, sweetheart pink roses, deep purple hydrangea, and a deep red-purple snapdragon. 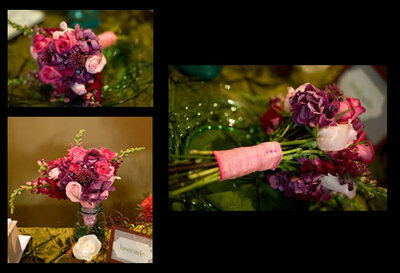 The bouquet was accented with jewels in shades of pink, purple, and blue to bring out the natural shades in the flowers, and was tied with pink silk ribbon with a gossamer overlay accented by three pink and purple pearl pins. 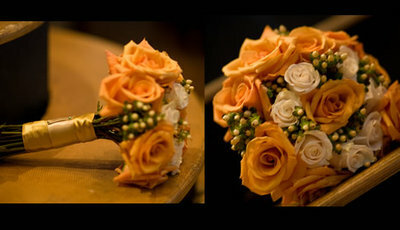 This bouquet featured full orange roses, hypernicum berries in cream, along with peeking creamy vendela roses. 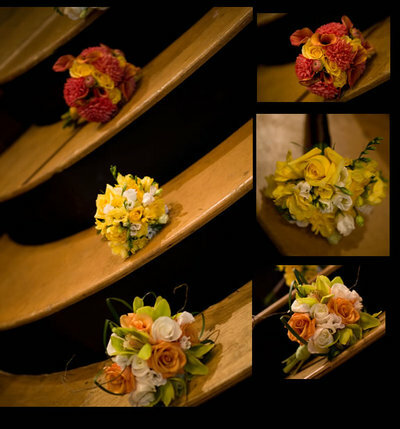 The bouquet was dressed with deep bronzy-gold ribbon and a champagne ribbon accent, secured with two green pearl pins for an understated elegance. 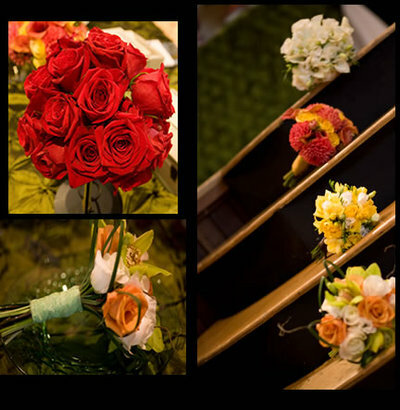 One last little featurette of our floral work for the show: a beautiful full bouquet of red freedom roses, another capture of lovely bouquets cascading down the ryman stairs to the stage, and a final side view of my favorite bouquet from the day. It was such a pleasure meeting & talking with brides, and stay tuned for another post this week featuring our paper goods at the show, along with the announcement of our drawing for a free bouquet!